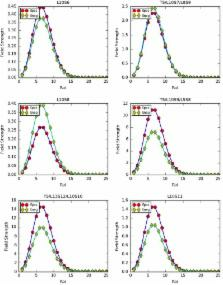 Aimed at the complicated problems of attraction characteristics regarding passenger flow in urban rail transit network, the concept of the gravity field of passenger flow is proposed in this paper. We establish the computation methods of field strength and potential energy to reveal the potential attraction relationship among stations from the perspective of the collection and distribution of passenger flow and the topology of network. As for the computation methods of field strength, an optimum path concept is proposed to define betweenness centrality parameter. Regarding the computation of potential energy, Compound Simpson’s Rule Formula is applied to get a solution to the function. Taking No. 10 Beijing Subway as a practical example, an analysis of simulation and verification is conducted, and the results shows in the following ways. Firstly, the bigger field strength value between two stations is, the stronger passenger flow attraction is, and the greater probability of the formation of the largest passenger flow of section is. Secondly, there is the greatest passenger flow volume and circulation capacity between two zones of high potential energy. Is the Boston subway a small-world network ? The mathematical study of the small-world concept has fostered quite some interest, showing that small-world features can be identified for some abstract classes of networks. However, passing to real complex systems, as for instance transportation networks, shows a number of new problems that make current analysis impossible. In this paper we show how a more refined kind of analysis, relying on transportation efficiency, can in fact be used to overcome such problems, and to give precious insights on the general characteristics of real transportation networks, eventually providing a picture where the small-world comes back as underlying construction principle. Understanding how congestion at one location can cause ripples throughout large-scale transportation network is vital for transportation researchers and practitioners to pinpoint traffic bottlenecks for congestion mitigation. Traditional studies rely on either mathematical equations or simulation techniques to model traffic congestion dynamics. However, most of the approaches have limitations, largely due to unrealistic assumptions and cumbersome parameter calibration process. With the development of Intelligent Transportation Systems (ITS) and Internet of Things (IoT), transportation data become more and more ubiquitous. This triggers a series of data-driven research to investigate transportation phenomena. Among them, deep learning theory is considered one of the most promising techniques to tackle tremendous high-dimensional data. This study attempts to extend deep learning theory into large-scale transportation network analysis. A deep Restricted Boltzmann Machine and Recurrent Neural Network architecture is utilized to model and predict traffic congestion evolution based on Global Positioning System (GPS) data from taxi. A numerical study in Ningbo, China is conducted to validate the effectiveness and efficiency of the proposed method. Results show that the prediction accuracy can achieve as high as 88% within less than 6 minutes when the model is implemented in a Graphic Processing Unit (GPU)-based parallel computing environment. The predicted congestion evolution patterns can be visualized temporally and spatially through a map-based platform to identify the vulnerable links for proactive congestion mitigation. This work was supported by Key Research and Development Project of Safety Assurance Technology of Urban Rail System under China National 13th Five-Year Plan; Award Number 2016YFB1200402; Grant Recipient: Yanhui Wang.